For her fantasy novel Dongeng, Anna Tan knew she wanted to explore uniquely Malaysian myths and legends. In recent years, we’ve seen a big push for diversity and representation in publishing and media. It’s a complex conversation with many conflicting opinions—most of which I’m not qualified to opine on, living as far as I am from the tension. On my end of the world, Malaysia is still very much trying to form a national identity, a cohesive Malaysian worldview that encompasses a nation made up of Malays, Chinese, Indians, Ibans, Dayaks, Orang Asli, Kadazan, and Dan Lain-Lain (“others”). We are diverse enough; it’s unity we’re looking for at this point in our history. I grew up as whitewashed as an Asian person can get whilst still living in an Asian country: in an English-speaking family, attending a missionary school, reading English fantasy books that were usually set in Britain or some form of medieval Europe. This week we feature Anna Tan and her novel Dongeng in Lorehaven Book Clubs. Stop by the flagship book club on Facebook to learn more about this fantasy novel. Cultural identity is something I have been struggling with for a long time. Am I Chinese (my ethnic roots) or Malaysian (my nationality) or am I somehow to be coded English (my linguistic base)? My first novella, Coexist, focused mostly on European/Western fairy tales, drawing on widely-known creatures such as dragons, elves, fairies, imps, trolls, and dryads. I’d even gone to some lengths to chase down several more obscure ones—to fit my original “mythical creatures from snowy places” theme—which led me to the adlet, Baba Yaga, and the Ghillie Dhu. I loved it. But personally, I wasn’t satisfied. Where were my people? Who was writing Malaysians with their ridiculous expressions and fantastic beliefs? This was something I was growing increasingly passionate about—seeing Malaysia and Malaysians on the literary map, not just for the standard World War II or colonial era sob stories, but in the genre I love the most—fantasy. So when I started writing Dongeng,2 the only thing I knew about it was that I wanted to touch on Malaysian myths and legends. As I said before, I’m rather culturally conflicted so writing local culture into Dongeng was very much a calculated risk. What if it was too unfamiliar to readers? (Some of it was unfamiliar to me and I live here!) What if I totally misrepresented the myths (and culture) because of how disconnected I was personally to them? What if the strange bubble I live in isn’t the real Malaysia and everything I know is a lie?! (Okay, that’s a little extreme.) And yet, what if… these were the kinds of stories people were now looking for? What if these fantastical tales resonated with people outside South East Asia? In Dongeng, you’ll find Sang Kancil the wise mousedeer from children’s stories alongside the pontianak and toyol from scary tales, Orang Bunian shyly make their appearance whilst Garuda and Jentayu fly across the skies, and the legendary Hang Tuah and his warriors once again seek adventure. It’s a little piece of Malaysia, a little piece of my heart—and also a little drop of diversity in a world that’s fighting for it. 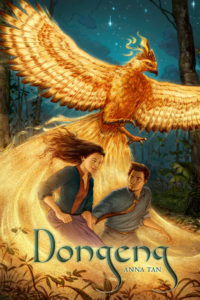 Explore Anna Tan’s newest novel Dongeng in the Lorehaven Library. I hope there’s a glossary helping with the name pronunciations and characters. It’s hard when we know nothing about the characters, the mythological ones.